Chambolle-Musigny continues to be an enigma to many tasters as we saw on this particular evening. The appellation is sandwiched between Morey-Saint-Denis to the north and Vougeot and Vosne-Romane to the south. 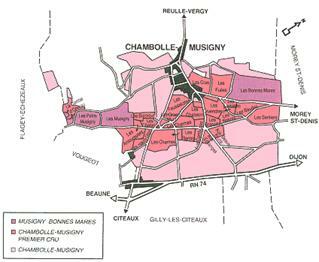 Chambolle-Musigny can be an excellent Burgundy, but it tends to lack the weight of Gevrey-Chambertins and Nuits-Saint-Georges, for example. "Delicate, yes. But feeble, no. Chambolle-Musigny's wines may be lighter in structures than those of Vosne or Gevrey, but they can and should be every bit as intense. Being less dense they will show the perfume of the Pinot Noir, not to mention the variety's inherent elegance, more radiantly." Both Bob and I found these to be really expressive examples of the Chambolle-Musigny terroir. Two wines well out-distanced the group of wines. They were both really nice. 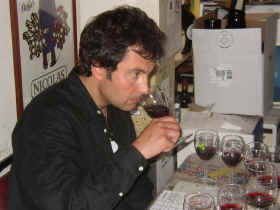 8TH PLACE: ALAIN HUDELOT-NOELLAT 2000 CHAMBOLLE-MUSIGNY "Les Charmes - 1er Cru"
Bob found a "simple Pinot with some spice and cherries but it's a bit 'watery' against its peers. It had the least 'stuff' of the set, unknit with raspy tannins; nothing 1er Cru about it; a Village wine." 7TH PLACE: DOMAINE COMTES GEORGES DE VOGUE 2000 CHAMBOLLE-MUSIGNY "1ier Cru"
another disliking a note of "chlorine and the bitter tannins." 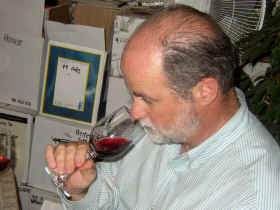 Bob found a wine "untypical of Chambolle in a way. True there was some nice deep cherry notes and Chambolle terroir (metallic, sulfur, and wet stone) but the cherries and herbs had an oddly Merlot-like edge to it. It's a tasty enough mouthful but there's that queer Merlot character again that is turning me off and there's heat (from alcohol) on the finish." 6TH PLACE: DOMAINE G. ROUMIER 2000 CHAMBOLLE-MUSIGNY "Les Cras - 1er Cru"
defender loved its "spice" and read the herbaceous note positively as "hints of rosemary." Bob much liked the wine too: "it has that special earthy character I associate with Chambolle and nice sharp-edged cherry Pinot fruit, sweet spice and creamy notes." His take on the herbaceous note was "fruit leaf." 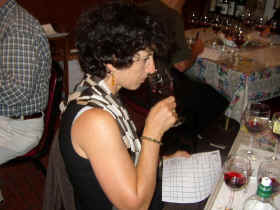 "The wine has that typical 'tight' Chambolle character and long! a nice mouthful with an orange zest finish, poised to develop very nicely indeed." 5TH PLACE: NICOLAS POTEL 2000 CHAMBOLLE-MUSIGNY "Les Cras - 1er Cru"
was struck with its "uncharacteristically low tannin and acid" Another agreed but "its silky texture brought it up for me." 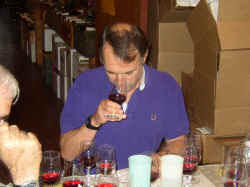 Bob found "ripe cherries and sweet spice and that typical Chambolle earthy note. A bit of leather shows up (traces of Brettanomyces) nicely. 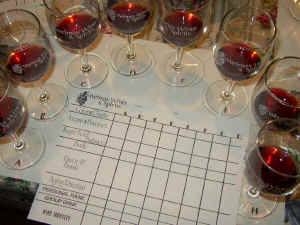 The wine is dry, tart, with under-ripe cherries. It's closed and undeveloped; tough to judge the future of this wine." 4TH PLACE: DOMINIQUE LAURENT 2000 CHAMBOLLE-MUSIGNY "Les Charmes - 1er Cru"
Bob, too, had some difficulty with this wine. "Spice from the oak dominates (cinnamon, clove) with earthy notes (sulfur) and a trace of H2S. This is oak lovers Pinot, one-dimensional fruit; but an undeniably a nice mouthful! This struck one taster as a "sharp, bitter wine." Another found it "pretty but weak on the palate, in spite of a nice entry and finish." Someone else found it very "berryish, strawberries and raspberries especially." 2ND PLACE: DOMAINE DUJAC 2000 CHAMBOLLE-MUSIGNY "Les Gruenchers - 1er cru"
(not a detraction) that I associate with fine Chambolle." 1ST PLACE: LEROY 2000 CHAMBOLLE-MUSIGNY "Les Fremieres"
structure and balance." 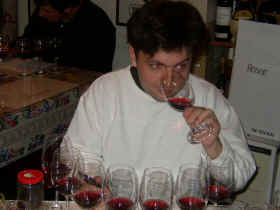 Another liked its "sweet smelling nose, rich and full" echoed by "great nose, deep and rich." Bob found it deeply spicy (from both wood and fruit), creamy, and quite generous and open for Chambolle. It has broadly flavored, rich ripe Pinot fruit with a slightly hot finish; reminds me more of Oregon Pinot than Chambolle."